Jim Vogel, President of Conestoga Ceramic Tile, recives his award. Pictured are: previous CTDA Hall of Fame Inductees and Rick Church: Rick Baldini, Best of Everything; Ed Metcalf, LATICRETE International, Inc.; Harold Yarborough, D&B Tile Distributors; Rick Church, Ceramic Tile Distributors Association (CTDA); Jim Vogel, Conestoga Tile; Tom Kotel, Mid America Tile; Tom Carr, Pan American Ceramics; and Doug Hayes, Florida Tile. For nearly 40 years, CTDA has been a leader in the Ceramic Tile industry, imparting the collective knowledge of years of experience in distribution and manufacturing. During that time CTDA has had the privilege of being guided by some of the best leaders in the industry. On Tuesday, October 30th, at the Total Solutions Plus Industry Awards Dinner, CTDA recognized two of these leaders with the CTDA Hall of Fame Award. This award recognizes outstanding CTDA and Industry Leaders, those people who were and are truly “members” of CTDA. They did and are doing more than just “belonging” to this great association. CTDA Hall of Fame Class of 2018 inductee Rick Church, Executive Director of the Ceramic Tile Distributors Association, receiving his award. 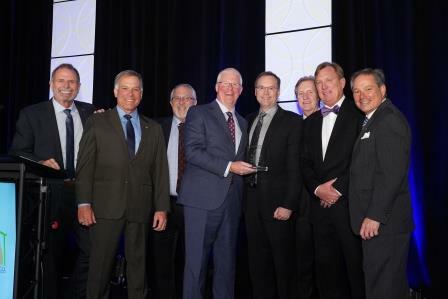 The first inductee into the CTDA Hall of Fame Class of 2018 was Jim Vogel, President of Conestoga Ceramic Tile. To view the video presentation for Jim Vogel, click here. 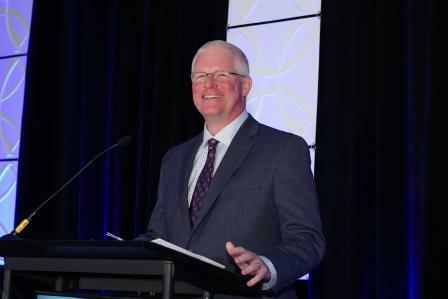 The second inductee into the CTDA Hall of Fame Class of 2018 was Rick Church, Executive Director of the Ceramic Tile Distributors Association, CTDA. To view the video presentation for Rick Church, click here. Previous recipients include: Tom Carr, Harold Yarborough, Doug Hayes, Rick Baldini, Dave Milanowycz, Tom Kotel, Ed Metcalf, Ralph Marra, Henry M. Rothberg, Fred Blackwood, Clarence Dowdy, Jack Vogel, Mike Miles, Manuel Magallanes, Svend Hovmand, Phil Stalcup, David Yarborough, Ted Clear, Jack Knies, Frank L. Garcia, Mary Yocum, Sam Widener, S. M. Van Kirk, Gail Schovan, Bill Ives, Tom Graham, Vince Pompo, Mark Carlson and Howard Pryor. For more information on CTDA contact the CTDA office at (630) 545-9415; fax (630) 790-3095; e-mail info@ctdahome.org or visit the association website at www.ctdahome.org.